Two Little Fishies (TLF) has released their new PhosBan Reactor 550, a larger version of the hugely popular PhosBan 150 model. TLF rates the 550 model as being able to accommodate up to a 600 gallon system. Up to 750 grams of PhosBan media can fit in the media chamber at one time, as long as you do not exceed the 8 inch height restriction. Similarly to their 150 model, a pump is not included, but any pump with 1/2 inch fittings can operate this model. The 550 employs the same upflow principle, which most efficiently uses PhosBan or filter media of your choice. 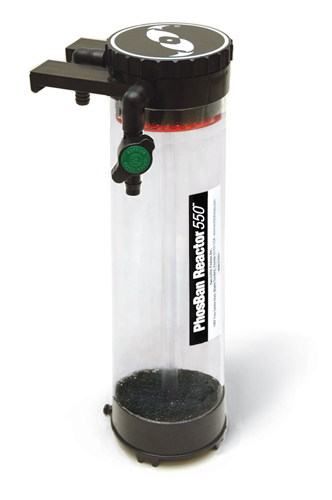 The Two Little Fishies PhosBan Reactor 550 can be installed in-line, in-sump, or as a hang on back (HOB) using the provided attachment. That’s great work by TLF. Finally there is an inexpensive great media reactor out there for larger tanks. That’s pretty cool. I haven’t seen one yet. This reactor looks great. I can’t wait to add two of those to my system. Looks like it would be really easy to daisy-chain them.